The Downtown Newnan Streetscape Project has greatly improved the pedestrian and vehicular environment in the historic downtown area of Newnan, Georgia. 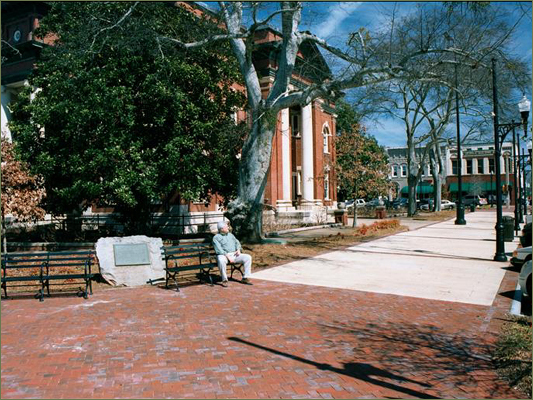 To enhance “the sense of place” and community in this southern town, Nimrod Long and Associates re-designed the downtown streets centered around the Coweta County Courthouse. Designs using colored concrete and sand-set brick recreated a sense of history. Intersections were reconfigured to slow traffic and improve safety by installing “neckdowns” at the crosswalks. The neckdowns not only protect walkers by making the crossing time shorter but also enclose the angled on street parking. Mid-block street trees that impeded the view of storefronts and business signs, or interfered with vehicular visibility, were removed and located in the larger planting islands. Custom streetlamps were ordered to match the existing historic streetlamps to recreate a more authentic identity, enhance evening visibility, and extend the positive downtown experience into the evening hours. The combined effects of these improvements have helped solidify the economic vitality of Historic Dowtown Newnan as the center of the community.